If it looks as though "midwife" Trixie Franklin has lost a bit of weight lately don't worry, the actress who plays her, Helen George, isn't sick, or wasting away. Quite the opposite, she's fit as a fiddle. As she told Women's Running Magazine though because of all the emotional distress her character was going through, she made the decision that she should "lose her curves". Not wanting to change her diet, George upped her work-out routine to include running and weight-training. Running the Virgin Money London Marathon. 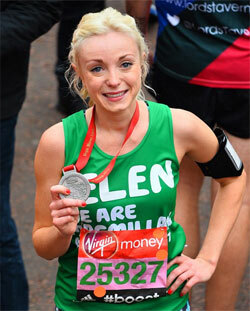 The 31-year-old actress then decided it was time to cross off her bucket list "running in a marathon" and a couple of weeks ago she did just that when she ran in the Virgin Money London Marathon in support of the charity Macmillan Cancer Support. George chose to run for Macmillan in recognition of the support they gave to her husband of three years, Oliver Boot, and his family when his father died of cancer. Although she'd never run in a marathon before, the Birmingham born George grew up in an athletic household. Her father was a long distance runner when he was young and her sister also runs. George is herself what she calls a "fitness fanatic", although finding time to work out with her Call the Midwife schedule isn't easy because of the 12-hour days involved in taping the show. For the marathon she would go straight home after a long day and an hour and a half of training. With husband Oliver Boot at the BAFTAs. It seems that George likes to keep busy. Just a few hours after she finished the marathon, which she completed in just over four hours, the bubbly blonde was all glammed up for her role as a presenter at the BAFTA Television Awards. As the actress tweeted before heading for the race course: "today's plan - run a marathon, present a bafta, crawl into a fetal position with a bottle of champagne!" What she hadn't planned on though was finding the run so emotional and she admits to having "cried all the way round". Despite appearing in a show where she is surrounded by real babies, George hasn't yet succumbed to broodiness. For now she's happy living in west London with her husband and two terriers. You can see George in Call the Midwife Sunday nights at 8pm on MPT.